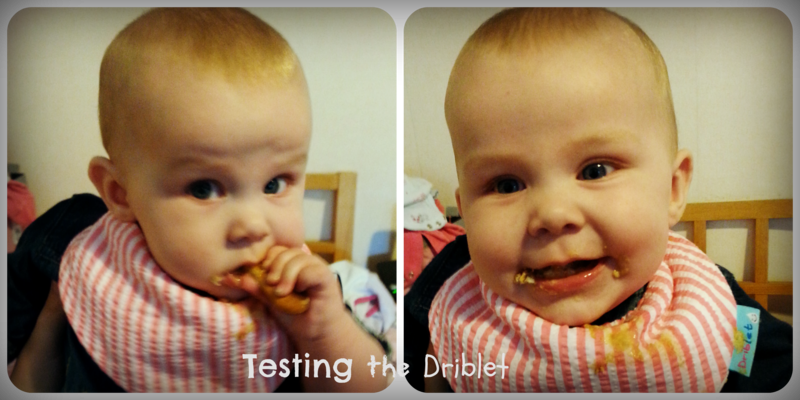 I was recently contacted by Driblet to ask if we wanted to road test their bibs. As Baby is teething at the moment, she is VERY dribbly and so I jumped at the chance. The lovely Ciara sent us two Driblets. On first inspection they were different to any bibs I have seen. They are padded, made up of three layers a top layer of 100% cotton, a middle layer of fleece and backed with 100% cotton. Most bibs we use end up soaked very quickly and often if Baby is particularly dribby, then her clothes get soaked underneath too. So we end up changing bibs with great frequency. We popped one on straight away and although they are thicker than our other bibs, they are also shorter and lighter. They really do soak up all the dribble and even when Baby had a cold and was playing in her Jumperoo (very bad combination) her clothes stayed dry underneath the Driblet (and that’s an extreme test!). I like the style, as they are slightly shorter in length, so I find I tend to leave them on, as you can still see her outfits. They wash extremely well and dry really quickly. This means that instead of using in the region of 7 bibs, washing and drying on a cycle, we now tend to just rotate the two Driblets. This one is super cute! At the moment there is a special offer of 2 Driblets for £10, which is great value for such a great quality product. I can genuinely recommend Driblets to anyone who wants a great looking product, which does exactly what it says it will!